The hotel sector can be a highly competitive one, with operators seeking any way they can to stand out from the crowd. 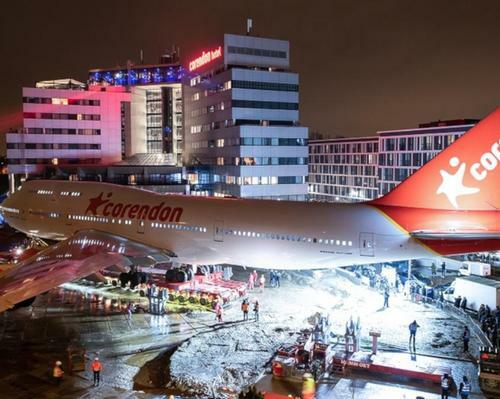 One Dutch hotel seems to have found an entirely new way of doing just that: by parking a decommissioned Boeing 747 parked in its garden. The former KLM City of Bangkok airliner served with distinction for 30 years, and was once baptised by nine Thai monks. Its flying days are now over and, repainted in suitable livery, the jet sits outside the Corendon Village Hotel in Badhoevedorp, about 12.5km (7.76m) from Amsterdam Schipol airport, from where it was transported across several kilometres of fields and one major road to its new home. The jet is soon to be turned into a 5D experience about the history of flight. Visitors will be able to walk on, over and under the aircraft, and visit parts, such as the cargo bay, the business class kitchen and the cockpit, that are not normally accessible to the public. They will be able to wing walk the 30-metre (98.4ft) long wings, and experience flying in all its facets through the 5D element that the attraction will have. A specialised transport company by the name of Mammoet was required to move the 160-tonne jumbo jet on a 200-tonne trailer with 192 wheels. A special road composed of 2,100 metal plates was constructed and bridges had to be built over 17 ditches to facilitate the journey from Schipol to Badhoevedorp, which proceeded at a speed of 5km per hour. Measuring 64 metres wide by 71 metres long (209.9ft x 232.9ft), the 747 has been lifted onto 1.5-metre high steel bases, built on heavy concrete slabs.